What problems will it create that would be worse than what we have now? There will be no incentive for anyone to produce anything. How bad do we have it now, compared to our great-grandparents who had to grow their own food by working 12 hours a day in the hot sun or freezing cold, or their grandparents who huddled in the bottom of a boat crossing the ocean from Europe because they could not survive there? We have it bad. Great-grandmas didn't even have to work to earn income. They just took care of the house. So that 12 hour work day our great-grandparents worked was for both of them. How many couples today work 12 hours a day between the two of them, not counting house work? Nobody is crossing the ocean anymore, because people overseas are now working less hours than Americans. The US has gone from the land of opportunity to the land of disadvantage. Which is what capitalism is all about. Keeping the 99% down and the 1% up. uhm no.... Capitalism is self-ownership. Regardless what the Demo fan pages tell you. The 99% can go make something that everyone wants. It's literally happening all around you in the town your in making it hard to understand how you do not see it. No because there are MANY rules in place that tell you how your allowed to create wealth, under what circumstances etc. For instance if I created a way to proliferate nuclear weapons by making plutonium easy to make the demand would be through the roof, I would be an instant billionaire but the govt would shut it down because I would be in competition. So only certain people are allowed to build wealth, this is a serious problem. I'm talking about wealth that is actually created, not fantasy wealth that is never created. Big difference. The wealthy put the bulk of their disposable money in investment vehicles that generate more money. Commonly in a passive way. Like the stock market. And that process by and large does not benefit the middle class. As opposed to buying extravagant goods, or more actively building or expanding a business, which might have some benefit for the middle class through employment. The middle class benefits enormously from successful business activity. Who do you thinks creates all those consumer goods that the middle buys? Why do you think the stock market exists, if not to build and expand businesses? the business activity as you call it is the end beneficiary because the poor and the working class spend most if not all of there income to support the economy while they hoard their money and keep it out of the economy. Are a few hundred billionaires helping you put money in your pocket or just adding more zeros to their net worth? We are lucky China and other nations with low wage workers are making all out stuff, otherwise we would be in huge trouble when a pair of cheap jeans cost $100 instead of $15. Aside from possibly new public offerings, or new stock offerings explicitly intended to fund expansion, stock market investments are mainly passive. Generally not actively creating new business and/or employment. Of course the invested middle class can also benefit from much the same stock asset inflation. 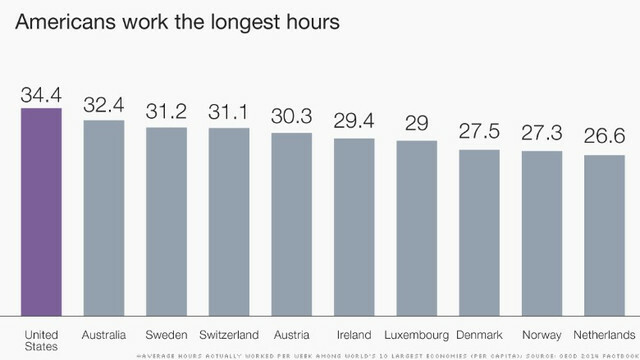 34 hours per week is not a lot of work, even if people in other advanced countries work less. About your great-grandparents: glad to hear they were in the top 10% of their time. Learn more about the history of your own country and people. The average work week in 1880, when my great-grandparents were economically active, was about 70 hours for an annual income around $7000 in today's money. It is possible to live on that if you cook all your own food, sew your own clothes, walk everywhere, etc. They had 8 children; the girls' bedroom was undoubtedly quite crowded. Of the 8 children, 7 survived to adulthood which means they were extremely lucky, extremely healthy, or economically very advantaged; I'm going to bet on the first. Life was not impossibly hard, and it was better than in the old country, but it involved twice as much work than middle-class life involves today, in much less comfortable conditions, for 1/5 of the money. There were no cars, no antibiotics, no air conditioning, and the telephone had just been invented and only a few thousand people had one. A half-century *later* Calvin Coolidge's son would die of an infected blister, a problem that by 1935 could be fixed with a dollar's worth of penicillin. Count your blessings. I think you greatly underestimate how much work your great grandma did “just” taking care of the house and kids.